A lot of people have problems with sleeping at night. A lot of medicaments will help you get asleep but small piece of them, are those which will cause you a side effects. The worst side effect that a sleeping pill will cause is addiction. Sleep deprivation can cause damage to your body in the short term. Over time, it can lead to chronic health problems and can dramatically lower your quality of life. In this post we are going to present you the remedy called 4-7-8 which is consisted from help by your tongue and mouth. 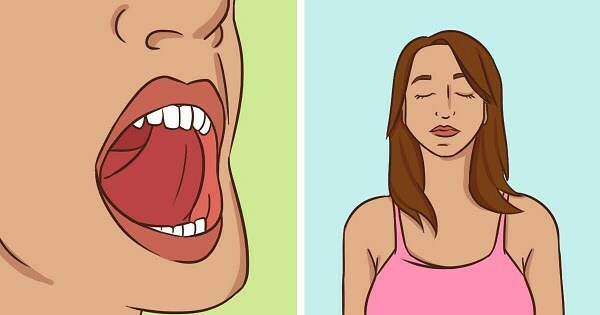 You need to place you tongue at the roof of your mouth and the breathing will help you to fall asleep faster. You can try this method because it is really effective and you have nothing to lose, you just can gain. You will be exhaling through your mouth around your tongue; try pursing your lips slightly if this seems awkward. 2. Exhale completely through your mouth, making a whoosh sound. 3. Close your mouth and inhale quietly through your nose to a mental count of four. 4. Hold your breath for a count of seven. 5. Exhale completely through your mouth, making a whoosh sound to a count of eight. 6. This is one breath. Now inhale again and repeat the cycle three more times for a total of four breaths. In addition we are going o present you a video which will help you understand this position of our tongue and it will help you understand this method.